Product #17924 | SKU 1SKB-SC191U | 0.0 (no ratings yet) Thanks for your rating! 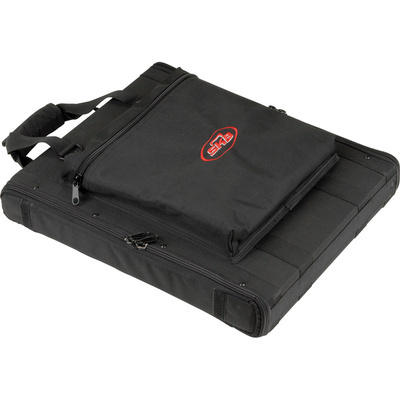 The 1U Audio Soft Rack from SKB makes a perfect way to carry those small but necessary items you need for your gig. Whether it's a wireless mic system, pre-amp, effects pedals or even sets of strings, this strong case will fill the bill. It's made with a wood core and covered with 600-Denier nylon - a strong combination that will protect against inclement weather and the back seat of your car. Carry it via its adjustable shoulder strap or loop handle. The front and back lids are padded and supplied with rugged zippers as is the internal zippered accessory pouch that is perfect for holding a wireless antenna. Conversely, the exterior features another zippered pouch for your cables or whatever else you need rapid access to. The inside also contains threaded rack rails for equipment but will not interfere with antenna placement. FAA and airline carry-on specifications are subject to change without notice, please cheque with your airline before designating this case as a carry-on item. Most airlines require carry-on items to have an external linear measurement that is equal to or less than 114.3 cm. The external dimensions of this case add up to 106.7 cm.